The main festival in Vietnam is Tết, but many others are celebrated throughout the year, for historical and religious reasons, such as Mid-Autumn Festival. Note that the dates of festivals refer to the lunar calendar. What happens: Tết is considered the most important festival in the Vietnamese calendar, and it is certainly the most popular. The idea of Tết is to start the year on a good note. Houses are cleaned, people buy new clothes, get haircuts, and family members come from across the country or even the world to gather in their hometown for this celebration. Firecrackers are often set off, as it is believed that the loud noise will scare away evil spirits. Boat races and dragon dances are also common as they are meant to bring good luck. Time: From the 16th to the 18th day of the first lunar month. Place: 18 Mai Van Ngoc Street, Ward 10, Phu Nhuan District, Ho Chi Minh City. What happens: It commences with prayers for peace which are then followed by traditional dance and martial art performances. Place: 710 Nguyen Trai Street, District 5, Ho Chi Minh City. Objects of worship: Lady Thien Hau. What happens: Her birthday ceremony is held at Thien Hau Pagoda, one of the oldest pagodas in Chinatown. Many Chinese people come to the festival; they make two effigies. Ong Thien, a good God, and Ong Ac, an evil God, both of whom are 3 meters high. At the end of the festival, the effigies are burnt as offerings. Origin: This festival marked the point in time when farmers were preparing to plant crops, and thdy needed strength to get rid of all the pests in their fields. Eating sticky rice dumplings were supposed to help give the body energy as well as cleanse the body out due to the lye used when cooking the dumplings. Origin: Vu Lan is a festival from Buddism on the 15th day of the seventh lunar month. The purpose of this ceremony is to wish that a dead relative’s soul avoids punishment in the next life. 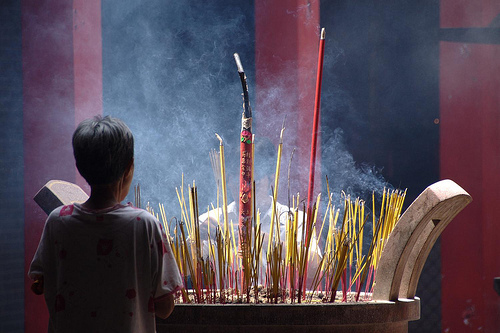 Today: There are offerings are rice, salt, and water to please the spirits. It is also used as the Vietnamese equivalent of Mother’s day, where people would give their mother a red rose. Origin: Tết Trung Thu is meant to bring a person or animal down from the moon. Some believe that it was a person whilst other versions include a carp who wanted to be a dragon. Children light lanterns in order to illuminate a path down for the person/animal. What happens: Children all around buy, or sometimes make, lanterns for themselves. Toys and sweets are also bought. Mooncakes are eaten, but they are mostly square, instead of the round Chinese type. They are normally a pastry case filled with sweet paste such as lotus paste or red bean paste and an egg yolk.